If you think you're the best driver on the road, you're not alone. The majority of American drivers think they are No. 1 when it comes to operating a car. Nearly two-thirds of drivers rate themselves as "excellent" or "very good," according to a new survey from Allstate Insurance. But your friends and neighbors are kind of lousy when it comes to backing you up. Americans rated fewer than a third of their friends as excellent or very good drivers. And out of state drivers? Fuhgeddaaboutit. More than half of Americans think good driving ends at their state border, rating out-of-state neighbors as only average or poor. Digging into the data, it seems that observers may be better judges than drivers themselves. For example, 90% of all drivers admit to speeding. Men also rate themselves as better drivers than women, yet are more likely to speed. (Some 48% of men said they speed, compared to 30% of women, according to the survey). "People totally forget how to drive," says Jonathan Theodore, who runs a defensive-driving program and an insurance-consulting group in New York state. In many states, taking a defensive-driving program every few years can reduce insurance premiums. 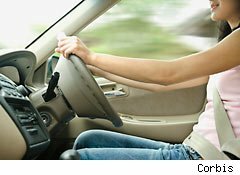 "You get your license when you are 16 or 17 and people forget the basics about proper merging and lane changing, and proper speed." While law enforcement is cracking down on doing things such as texting and calling while driving, distractions remain a top hazard. Seven out of 10 drivers admitted to slamming on the brakes suddenly or swerving to avoid an accident because of an in-car distraction, according to the survey. What is a driver to do? Be a defensive driver, Theodore says, which means defensively operating your vehicle despite the mistakes others are making. So don't eat a sandwich, apply lipstick or turn around to discipline the kids. "Driving itself is multitasking," he says. "Your eyes are moving back and forth and you're looking in the rear-view mirror."